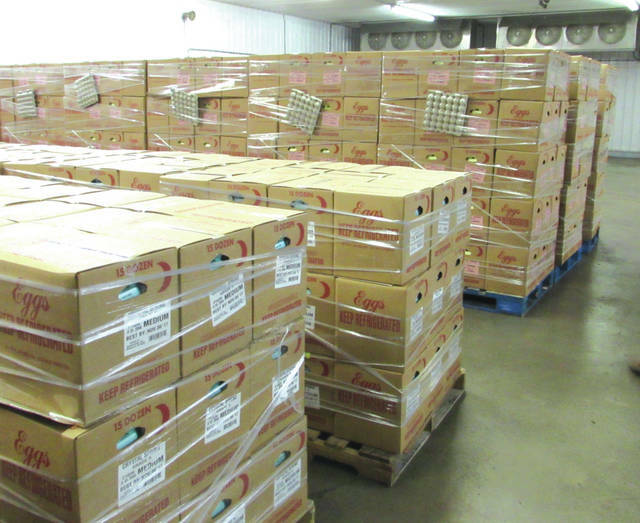 Pallets carrying 144,000 eggs at the Weaver Eggs’ Versailles, Ohio, facility are ready to be loaded and shipped to Orlando, Florida. The eggs will be distributed by Second Harvest Food Bank of Central Florida to families in need. Weaver Eggs President Tim Weaver (left) joined (left to right) Alex Weaver, Zach Kohli, and Chuck Jenkins to see the company’s egg donation to Hurricane Irma victims being loaded onto a semi-truck trailer Wednesday morning. The shipment will take two days to reach its destination in Florida. VERSAILLES — A local business has hatched a plan to aid thousands of families made destitute and hungry by Hurricane Irma. 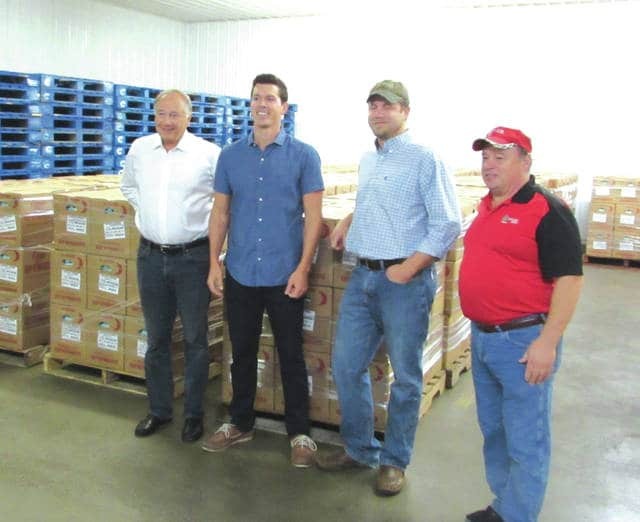 Weaver Eggs of Versailles, Ohio, a top egg producer in Darke County and the state, is shipping 144,000 eggs, or 12,000 dozen, to Florida. In partnership with Winn-Dixie Supermarkets, the eggs are being shipped to the Second Harvest Food Bank of Central Florida where they will be freely distributed to those in need. Weaver Eggs President Tim Weaver said the company is “very happy” to partner with Winn-Dixie to provide Hurricane Irma relief to the citizens of Florida. The semi-truck carrying the eggs, packaged securely and wrapped in pallets, left the docks at 10 a.m. Wednesday morning. Weaver said the shipment should arrive in Orlando, Florida, by 8 a.m. Friday morning. Weaver said the company’s management team came together to make the decision to help. Weaver said this initiative is from the heart, not an act of publicity. “I think government is doing the best it can down there. Many organizations, such as Weaver Brothers, are also trying to help the people of Florida and in Texas,” he added. Weaver said this is the company’s largest, one-time egg donation thus far, but Weaver’s giving back to the community is definitely not a one-time thing.